Bob Marley and Stevie Wonder had great respect for each other. Bob and the Wailers music was influenced by American R & B and Stevie Wonder. And Stevie even wrote a song called “Master Blaster” as a tribute to Bob. Their friendship lead them to share the stage together on a few occasions. The first time would be at The Dream Concert which has been often called The Wonder Dream Concert. The 2nd time was in 1979 at the Black Music Association concert in Philadelphia, Bob was joined onstage by Stevie Wonder for the encore (Get up stand up and Exodus). 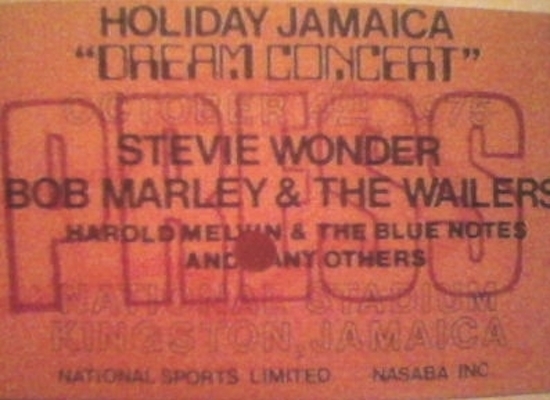 The Wonder Dream Concert was an historic concert held on October 4, 1975, at the National Stadium in Kingston, Jamaica. The concert was headlined by Stevie Wonder who was joined on the bill by Bob Marley & The Wailers and his former bandmates Peter Tosh and Bunny Wailer. The concert is sometimes known as the Wailers Reunion Show, as it was the first time the original Wailers had performed together since 1973 and the last time they ever would. The concert was a benefit concert for the Jamaican Institute for the Blind and was opened by Third World. For Stevie Wonder’s encore, Stevie called for Bob to join him on stage and they played “I Shot The Sheriff” and “Superstition” together. Another notable moment was the last performance of the original Wailers’ first hit “Simmer Down”, originally from 1964.